This is an ideal heavy body impression putty (Shore A - 55). Two part 1:1, A:B. RTV platinum cure at 77°F approximately 5 minutes. This material is green and white and can be kneaded by hand and worked into place for extremely accurate replication of parts. 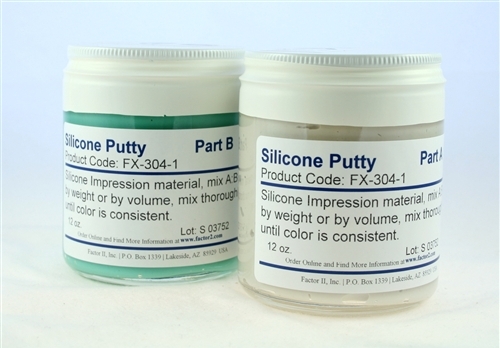 This putty is also ideal for backing the FX-302 Impression Elastomer, as an alternative to plaster or plaster bandage. Bonds tenaciously to the FX-302.